An unabashed home copy of Trader Joe’s Super Spinach Salad. 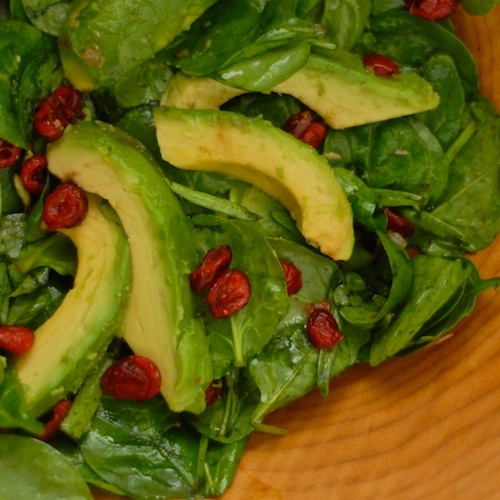 The reds and oranges against the dark green baby spinach leaves make a gorgeous meal. It’s enough for a full lunch or dinner on its own. It’s great with baby spinach leaves, but romaine works too. Cook the quinoa for this- it only takes 15 minutes- while putting ingredients in the blender for the carrot-ginger-miso dressing. 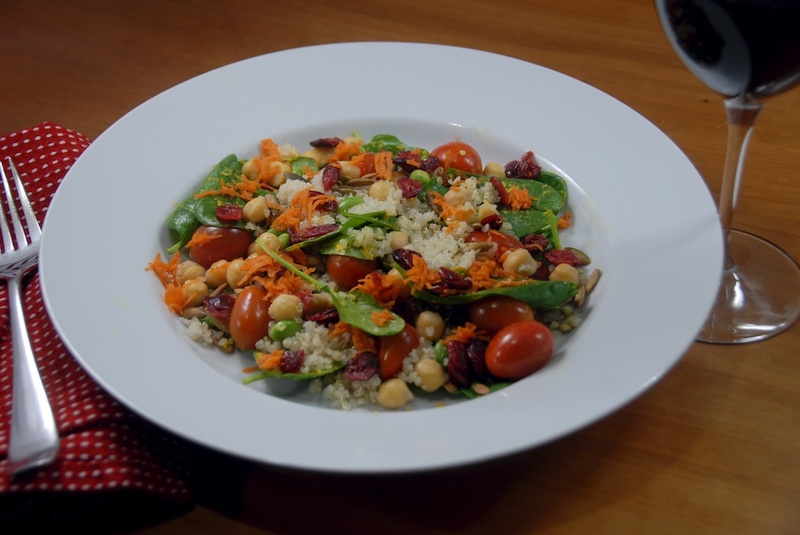 Now serve the greens onto dinner plates, then sprinkle each salad with quinoa, grape or cherry tomatoes, edamame, chickpeas, pepitas, dried cranberries, and finally shredded carrots. This has everything you need: whole grains, protein, seeds, and lots of veggies. Please let me know how you liked it by leaving a comment! Assemble the ingredients for the salad. The chickpeas can be rinsed from a can, freshly cooked, or from your freezer. I use frozen edamame. They can be boiled for five minutes on the stove or defrosted and cooked in the microwave. Dry roast the pepitas in a pan for two minutes or so, stirring constantly, until they start to turn brown. 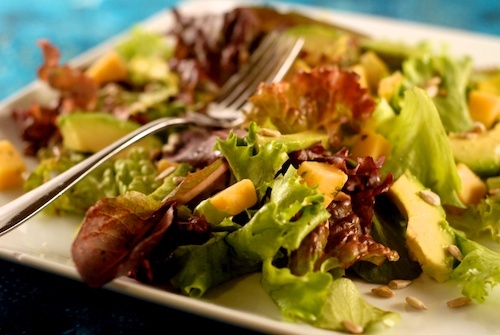 Toss the salad greens with the dressing. 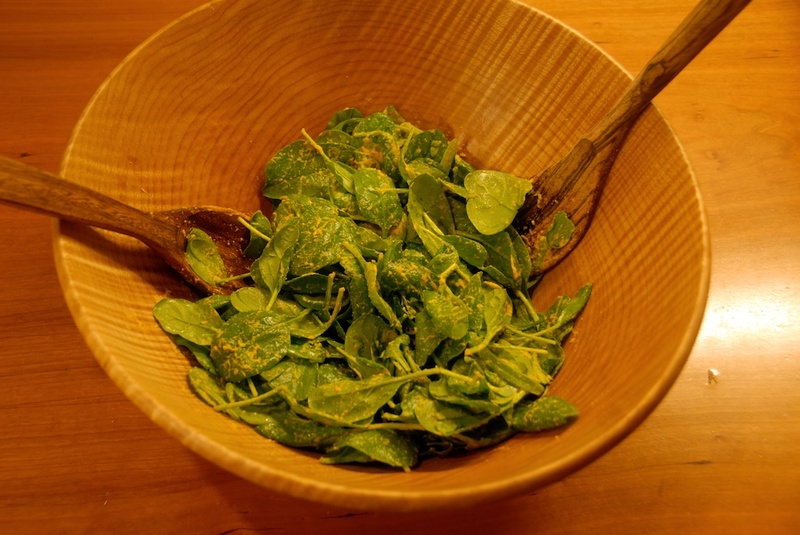 Serve the salad greens onto dinner plates. Sprinkle the greens with the cooked quinoa. Add the other ingredients in layers, starting with the tomatoes, then the chickpeas, edamame, pepitas, dried cranberries, and finally the shredded carrot. Wow that looks delicious. I love the colors too. Thanks, Laurie, I love the feedback! Think you might try it? I was so excited to see this since I really liked the salad a lot and wanted to make it at home. I plan to try your recipe out soon. Thanks for letting me know! The Trader Joe’s Super Spinach salad is my most visited post and yet you are the first person to comment, so I really appreciate hearing from you! If you do make it, let me know how you like it. Thank you so much for this recipe! This is my favorite salad at Trader Joes, but since moving I have to drive an hour and a half to the nearest one and I crave this between trips! Thanks, Julia, I love hearing from readers, it makes me really happy to know that the recipes are helpful! Thanks for posting this – just had it for the first time after my first visit to TJ’s yesterday and loved it. Now I’m looking forward to making this at home. Hi Jen, I’ll bet you’ll be back to TJ’s, I shop there a lot and I like their prices on things like organic produce. Thanks for letting me know that you’re going to try the recipe! If you have any feedback after you try it, please stop by again. 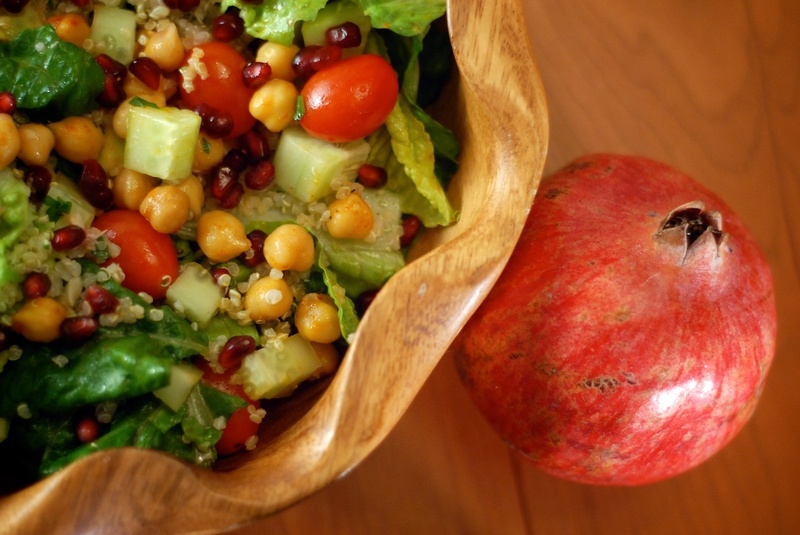 LOVE this salad!!! The carrot miso dressing is so good! Thank you so much for sharing it with us. I’ll definately make it at home now. Thanks for commenting, Joy, I loved hearing from you! 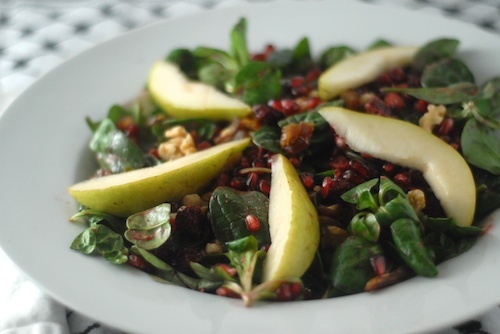 I was looking for a spinach salad that would allow me to use up my cranberries and this is it! Thanks for letting me know, Jen, I like hearing where this recipe is getting to! I LOVE the TJ’s Super Spinach salad. In fact, I’m about to have some for lunch. I am determined to make this as part of Thanksgiving dinner, and will try your recipe before then. I wish you listed the uncooked amount of quinoa and chickpeas to use. My only bones with the salad is the tomatoes–they don’t really go with the rest of the salad. But since I love the color, I’m going to use chopped red pepper. Thank you so much for this delicious-looking recipe. Thanks for commenting, Elaine! Quinoa expands about three times from raw to cooked, so about a half a cup of quinoa would yield 1 1/2 cups of cooked quinoa. I haven’t checked that exactly, I have only cooked a pot of quinoa and used part of it for the recipe. Beans expand about 2 1/2 times their size when cooked, which mean it would only take between 1/3 and 1/2 cups of raw chickpeas to make a cup of cooked chickpeas. With all the soaking and simmering required it probably wouldn’t make sense to cook such a small amount of beans. I’d make a bigger pot of chickpeas (perhaps using my basic chickpea recipe) and use or freeze the remainder for other purposes. Or else I would use canned chickpeas, even though they are not quite as good. Let me know how the recipe works out for you, I’m curious to know! I made this a couple of weeks ago and loved it!! It tasted just like the TJ’s version, only better and more fresh. Saved me a lot of money too! Thank you for posting. Hey, thanks for letting me know, Courtney, I appreciate hearing from you! Glad it was a hit and saved you some money! The 6 oz of spinach in weight and not fluid ounces (like 1/2 a cup) correct? Yes, in weight, hope that helps!